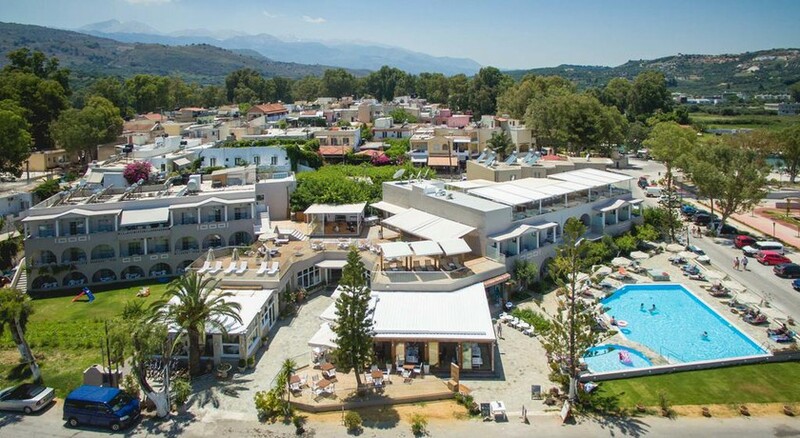 The Montreal Hotel Georgioupolis is a seaside 2-star hotel located in Georgioupolis, Crete in Greece. The hotel is 400m away from the nearest beach, Georgioupolis Beach. The hotel is centrally located in the town of Chania. Take a refreshing dip at the outdoor swimming pool after a day of fun and travel. The hotel is tastefully decorated with bright and vibrant colours that give the rooms an airy, beach-like feel. The hotel houses a bar and restaurants that serve a variety of international and local cuisines and guests can enjoy a wide range of alcoholic and non-alcoholic beverages. Being a part of the popular Fereniki group of hotels, Guests can enjoy at multiple pools and eateries housed in all the hotels of the group which are closely located I the same complex. The Montreal Hotel Georgioupolis is located 47.2km away from the Chania international Airport. The Heraklion Airport is located around 107km away from the property. The nearest beach, Georgioupolis Beach, is located just 400m away from the airport. The hotel is located in the town of Chania. The hotel can arrange for car rentals for their guests for their local excursions and airport pick-up and drop. The Montreal Hotel Georgioupolis offers a total of 20 rooms for its guests. The rooms are fully equipped with essential, modern day amenities to make their guests comfortable. The rooms are equipped with amenities like a mini-fridge, telephone, safety-deposit boxes, individually controlled air-conditioning units, among others. The bathrooms are equipped with all essential amenities and necessary toiletries. The linens provided by the hotel are regularly changed and the rooms are cleaned regularly by the house-keeping staff. The Montreal Hotel Georgioupolis has an in-house restaurant that serves a variety of international and local Greek cuisines and a bar that offers a variety of local wines and signature cocktails. The guests can enjoy American buffet breakfast at the onsite restaurant. The Fereniki Group that runs the hotel, has several restaurants and bars that serve Italian, American, among others cuisines. These restaurants are located close to the hotel. The guests can also choose the all-inclusive package while booking. The proximity of the hotel to the town of Chania allows the guests to experience the local cuisines at the bars and restaurants. The Montreal Hotel Georgioupolis features a beautiful pool that allows the guest to indulge in mild pool games. The proximity of the hotel to the beach also allows the guest to try some water sports like water skiing, pedal boats, ringo rides, banana boat, canoeing and windsurfing, which are easily available at the Georgioupolis Beach which is located at a walkable distance of 400m from the hotel. The vacationers looking forward to have a quiet, relaxing holiday can also indulge in sunbathing at the Georgioupolus Beach. The guests can avail the cab rentals offered by the hotel and visit various tourist attractions and the town of Chania and experience the local life in Greece.